Home > Community > Teachers' Voices > Matthew's Classroom > New Posts > 39. APRICOT MATES MEETING! I love the timing of Golden Week. It comes exactly one month into the new school year. Every first month of every new school year requires new adjustments, new assessments and new stresses. By the time Golden Week comes we have more or less accustomed ourselves to these and we can briefly relax before getting into the year ahead in earnest. By and large I have settled nicely into my new preschool responsibilities and am enjoying it very much. There is much hard work ahead! Away from the classroom, the APRICOT Mates Meeting is less than a month away! This meeting will celebrate the organization’s 5th anniversary, and I’m looking forward to it very much. The program this time includes more activities for participants than ever before. Of these, one I feel has particular value is the “Speech Time” activity. Here participants share their current situation and past experiences. I’m personally very interested in hearing what teachers are concerned about regarding their teaching; the areas of teaching that teachers feel they want more insight on. I’m keen to hear this because up to now, the basis of all my presentations for APRICOT has been MY own experiences, and not those of other teachers. 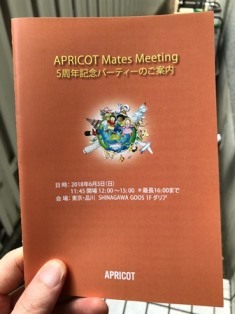 So if you are a qualified APRICOT Mate and are attending this meeting, please give thought to this segment because it will have an impact on future APRICOT seminars! Let’s all have a great first term! ＊The APRICOT Mate Meeting is only open to those who have completed Mikiko Nakamoto’s Children’s English Teacher Training Course, are Learning World certified schools, and have applied to and been accepted as APRICOT Mates.